Quite simply, we make the very best arrows there are. In our thinking, arrows are either perfect or not, there are no grey areas. Attention to detail is everything. When we make a set of arrows we want the archer to experience a positive performance gain via our engineering and application. 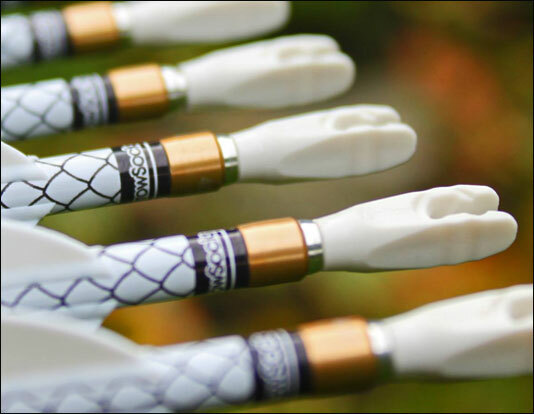 Our arrows must also have maximum durability, longevity, accuracy and consistency. Longevity and strength are very important factors for beginners arrows that will undoubtedly take a lot of punishment. The fletchings have to stay on and the points stay in. For more advanced archers, accuracy is the key. Apart from perfect function, our arrows also look fantastic. Our customers can choose personalisation and custom graphics for their arrows from our partner ArrowSocks. As CMA is not tied to any retailers it means our customers have a far wider choice of component combinations. If it's available in the UK, we can get it. Everything we do is backed up with impeccable, personal customer service. We will also provide ongoing customer support if required and are always available to take customer communications. You might expect to pay a premium price for such a premium service, but you would be mistaken. Our prices are in line with low cost retailers. Why not have a look at our customer gallery to see some of our amazing creations and read what past customers have to say about us. Fill out our contact form today and let us quote for your new set of arrows. Don't worry if you're not sure what you want or need, just drop us a line a we'll be more than happy to guide you through the whole process and offer advice as needed.